Under its brand e-goes, Proactive Mobility specialises in innovative, portable, electric powered transportation. In a phrase, smart e-mobility. The company pioneered the concept of folding powered chairs into the UK and says it is very knowledgable about carefully sourcing the best products in each category. 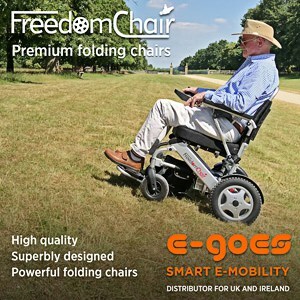 It is now a major distributor of the leading brands in this sector, FreedomChair and Joyrider. Believing e-mobility is for everyone, whether needed for that last mile solution for a user’s commute or assistance to get someone mobile with the minimum of effort, the company is now looking to work with dealers across the UK. Described as the originators of the concept of the folding powered chair, FreedomChair are always at the top in terms of design, innovation and quality of manufacture, with Proactive Mobility emphasising that they are THE premium brand in this sector of the market. All chairs in the range fold in literally a couple of seconds and fit most car boots, making a larger or specially adapted vehicle often unnecessary. Each of the two sizes of chairs are available in standard 10” rear wheels or larger 12” versions, with more powerful motors for travelling over challenging surfaces. Absolutely ideal for days out, shopping trips and cruises, FreedomChair will widen a user’s horizons and set free their personal mobility. One glance will tell you, the JoyRider is not your ordinary folding travel scooter or power chair. It’s an inventive motorised chair that the company describes as being in a class of its own. Outdoor and inside, it’s nimble, quick and stable through the turns and boasts a modern, clever minimalist design that folds instantly. Performing well both indoors and on trips out and about and folding flat instantly to fit into nearly any car boot, store in a cupboard or keep inside a user’s cruise ship stateroom, the Joyrider is a chair that could be a welcome addition to any dealer’s showroom. The powerchair boasts an integrated Li-ion battery, with a full charge taking less than four hours and powering the JoyRider for up to 8 miles, whilst the chair’s electromagnetic brakes built into the brushless motors bring users to a controlled stop and hold firm on an incline.